Believe it or not, Microsoft actually made it easier to change default programs in Windows 10 by adding this key functionality to the Settings app. You can still change your default programs in the Control Panel as with previous versions of Windows — at least for now. Nevertheless, we would encourage you to try using the Settings app since it places some of the most common default app choices right up front. To change a default program via the Settings app go to Start > Settings > Apps > Default apps. At the top of the page, you'll see the heading Choose default apps followed by a list of apps for basic defaults including (in alphabetical order) email, maps, music player, photo viewer, video player, and web browser. The only key app missing from that list, if you ask us, is your default PDF reader. Other than that, we'd wager most people will often find the app they need to change in that list. To change a selection, click on the current default app in the list. A panel will pop-up with all the various programs that are eligible to replace your current default. 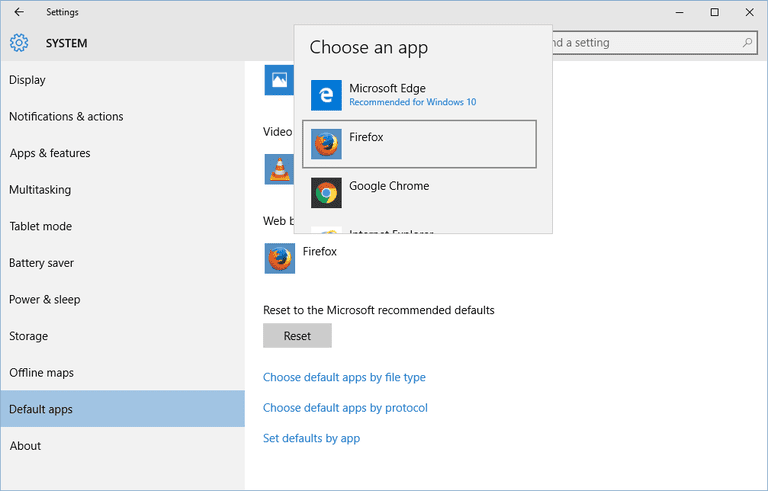 If you wanted to change Firefox on your system, for example, (as seen in the picture above) you could choose Microsoft Edge, Chrome, Internet Explorer, Opera, or you could search the Windows Store for a new app. To change the default click the program you want from the pop-up panel, and you're done. Sometimes, however, changing your web browser or email program just isn't enough. For those times it's easiest to use the Control Panel for swapping defaults. Unless you know what you're doing, don't mess with the option to change your programs by the protocol. Instead choose to change your defaults by app, which will launch the Control Panel version. Let's say Groove Music is your default music player and you'd like to switch to iTunes. Scroll through your list of programs in the Control Panel and select iTunes. The former sets iTunes as the default for every file type the program can open. The latter lets you pick and choose if you just want to select a specific file type such as M4A or MP3. That said, if you do want to choose a default program by file type it might be easier to do that in the Settings app. You can do this by going to Start > Settings > System > Default apps > Choose default apps by file type. This will open a screen with a long (and we mean long) list of file types and their associated programs. If you wanted to change the default PDF reader, for example, you'd scroll down to .pdf in the list, click on the current default program, and then a list of possible default programs will appear. Choose the one you want and that's it. Microsoft's method for setting defaults in Windows 10 is a little annoying since you end up bouncing between the Settings app and the Control Panel. The good news is this won't be the case forever as Microsoft intends to replace the Control Panel with the Settings app. That way you'll have a universal settings experience across all Windows device types including PCs, tablets, and smartphones. When that will happen is unclear, but don't count on the Control Panel disappearing anytime soon. Even though the Settings app is getting better, some key functionality still resides in the Control Panel such as the ability to uninstall programs and manage user accounts. For now, we'll have to muddle through with a dual world where some settings are changed in the Control Panel while others are taken care of in the Settings app.